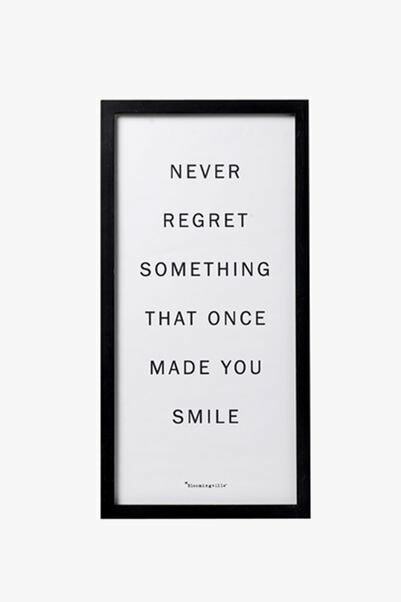 Never regret something that once made you smile — isn’t this a lovely print. I usually like to do roundups, but I feel like this one deserves to stand on its own. We – as humans – typically tend to look back on our lives and shake our heads. Oh, the mistakes we have made! But I think that’s the wrong attitude. Why not instead rid yourself of regret and remember all that you were as if you were still in those moments? Those blissful, reckless, and YOUNG moments! Stop judging yourself. Stop being your worst enemy. If this isn’t a great message for 2017 and beyond, then I don’t know what is. I just want to note this is an International Sale site. I loved the quote so much – I still wanted to post it! For more style finds, visit my fashion section or just hit up my decor vertical. If you’re into quotes… then just head here.